Construction steamfitters assemble, install and maintain piping systems and components that carry water, steam, chemicals, air and other fluids needed for processing, manufacturing, heating, cooling and refrigeration. Service steamfitters troubleshoot, diagnose, repair, calibrate and maintain the components of heating, cooling and refrigeration systems as well as process systems used in manufacturing. Construction steamfitters work inside and outside, sometimes in adverse weather conditions. The work is active and strenuous requiring walking, standing, climbing, lifting and working in cramped or high areas. Service Steamfitters work indoors in equipment rooms as well as some outdoor repair work. They use test instruments and tools in trouble-shooting and repairing of HVACR and DDC systems. Upon completion of the Plumbing Apprenticeship you will earn 32 college credits towards an Associates Degree in Construction Supervision. Continuing Education and many Certification classes are offered for Journey persons to upgrade their skills. Watch the video below on: The United Association of Journeymen and Apprentices of the Plumbing and Pipe Fitting Industry of the United States, Canada and Australia (UA), affiliated with the national building trades, represents approximately 370,000 plumbers, pipe fitters, sprinkler fitters, service technicians and welders in North America and Australia..
As you can see by this list there are many opportunities to further advance a career in the piping industry. Training thru an Apprenticeship can go a long way towards making a good living here in Northeastern Wisconsin. 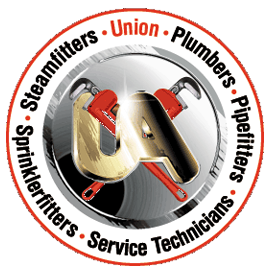 The United Association of Journeymen and Apprentices of the Plumbing and Pipe Fitting Industry of the United States, Canada and Australia (UA), affiliated with the national building trades, represents approximately 370,000 plumbers, pipefitters, sprinkler fitters, service technicians and welders in Local Unions across North America and Australia. From humble beginnings of 40 delegates representing 23 independent unions in 10 states and the District of Columbia, the United Association has grown to a powerful, international union representing over 370,000 members in more than 300 local unions throughout the United States, Canada and Australia. This October, we will proudly celebrate our 125th anniversary.